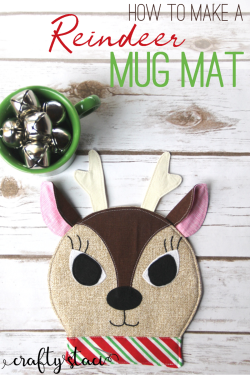 "This reindeer mug mat is a great gift to make for a teacher, neighbor or friend! It's large enough to hold a mug and a treat, but still won't take up too much room on their desk. "You’re going to want to make this mug mat for someone you really like. Of course, I hope all of your work goes to people in that category, but this one is a little more work than some. That said, I’m going to stop talking and just jump in so you can get started on it."